A few phone calls and e-mails later, I discovered that WSDOT does, in fact, own a fallout shelter. Technically, it’s also categorized as a bridge, since it holds up part of I-5. 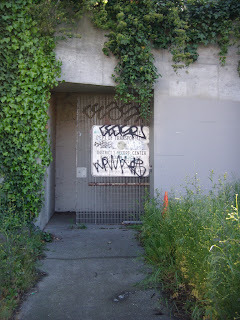 And as far as WSDOT historians can tell, it’s the only bridge/fallout shelter/highway combo in the U.S.
Tucked under the southbound lanes of I-5 at north end of the Ravenna bridge is an innocuous metal gate with a graffiti-covered sign reading “Washington State Department of Transportation: District 1 Record Center.” To the casual observer, it’s just another door to just another WSDOT storage facility. But if you happen to know the man with the key (and I do), you’ll quickly find out that this storage facility has an intriguing history. Forty-seven years ago, it was dedicated as an innovative public fallout shelter. Later, it was used as a Department of Licensing office and a WSDOT records storage facility. Today, it sits empty – a snapshot of Cold War history hidden beneath the highway. Walking up the stark concrete tunnel into the heart of the fallout shelter is a bit like stepping back in time. It’s also a lot like walking into a refrigerator. This place literally puts the “cold” in Cold War. Of course, had there been a nuclear blast and had I been one of the 200 people the shelter was designed to serve, I doubt I would have cared much about the interior decorating or the lack of heat. Very little of the fallout shelter is designed for aesthetic appeal or comfort. From the folding metal chairs to the impossibly small bathrooms, to the institutional green and mauve color scheme, the fallout shelter is government utilitarianism at its best. A giant concrete pillar in the center of the shelter supports the 18-inch-thick concrete roof of the 3,000-square-foot room. From overhead, the muffled sounds of I-5 traffic filter into the shelter. To the right, a particleboard wall cuts across the room to form a makeshift office, a relic of the shelter’s 14 years as a Department of Licensing facility. Ahead, the doors to three small rooms stand open, the spaces vacant save for an old rotary phone and a 1969 day planner. In the event of a nuclear attack, the rooms would have been used for food storage and distribution, medical care, and day-to-day shelter operations. To the left, down the hallway leading to the escape tunnel, are two doors to his-and-hers bathrooms and decontamination showers. For the suggested 200 shelter-ees: Three toilets, one urinal, two sinks, two showers. All of which are accessible through doorways that – at best – might be 28 inches wide. It’s enough to make airline bathrooms seem positively spacious in comparison. Adjacent to the bathrooms are the low double doors leading into the escape tunnel. We pried its doors open for likely the first time in 40 years and found it to be surprisingly clean, save for a nest of some sort wedged into a crevice and several decades’ worth of cobwebs. A row of caged lights lines the right side of the round concrete tunnel. At 48 inches in diameter, the tunnel was surprisingly easy to navigate – at least for someone my size. It didn’t take long for me to walk (well, waddle, really) the 85 feet to the gated tunnel exit a few feet up the street from the main shelter entrance. Down the tunnel from the main room of the fallout shelter, a set of double doors lead into the mechanical heart of the shelter. On one wall, in a glass display case, are the original, meticulously hand-drawn diagrams and typed instructions on how to operate the generator, well, and heating and ventilation system. The authors clearly assumed most shelter evacuees would be unfamiliar with mechanical operating systems, so the instructions read a bit like a 1960s-era “Fallout Shelters for Dummies” book. Important items noted in the step-by-step directions were labeled with paper tags, many of which still remain. Standing on the sidewalk, with the gate firmly closed and locked again, this place is easy to overlook. It doesn’t look much like a fallout shelter, but then again, I guess I don’t know what a fallout shelter is supposed to look like. And I hope I never have to.